The study demonstrated that the Reef’s network of green zones are yielding wide-scale population increases for coral trout, the primary target species of both the commercial and recreational sectors of the hook-line fishery. It also found that reefs in green zones supported higher numbers of large, reproductively-mature coral trout, even after being damaged by cyclones—such as tropical cyclone Hamish, which hit the reef in 2009. The study received funding from the Australian Government’s Marine and Tropical Sciences Research Facility (MTSRF) and the National Environmental Research Program (NERP), the Australian Research Council (ARC), the CRC Reef Research Centre, and the Australian Institute of Marine Science. The study suggests that the original Marine Park zoning plan that was put in place in the 1980s began to improve fish stocks, but that the expanded protection in 2004 greatly improved on this. Hugh Sweatman, also of AIMS and co-author of the paper, said “Australia’s Great Barrier Reef Marine Park is looked upon as a benchmark for large-scale reserve networks around the world. Unlike many places where coral reefs are found, Australia is a developed country where fishing is fairly light and well regulated. Yet even here we see clear effects of fishing – the benefits of no-take reserves would be much more obvious where large coastal populations depend on reefs for their daily food, so fishing is more intense and everything is taken. Article title: Expectations and outcomes of reserve network performance following re-zoning of the Great Barrier Reef Marine Park. Read the full paper here. The numbers and size (biomass) of coral trout since the 1980s was on average 2.5 times greater on no-take green zone reefs than on reefs that are open to fishing. Coral trout biomass has remained relatively stable in areas open to fishing since the early 1980s. 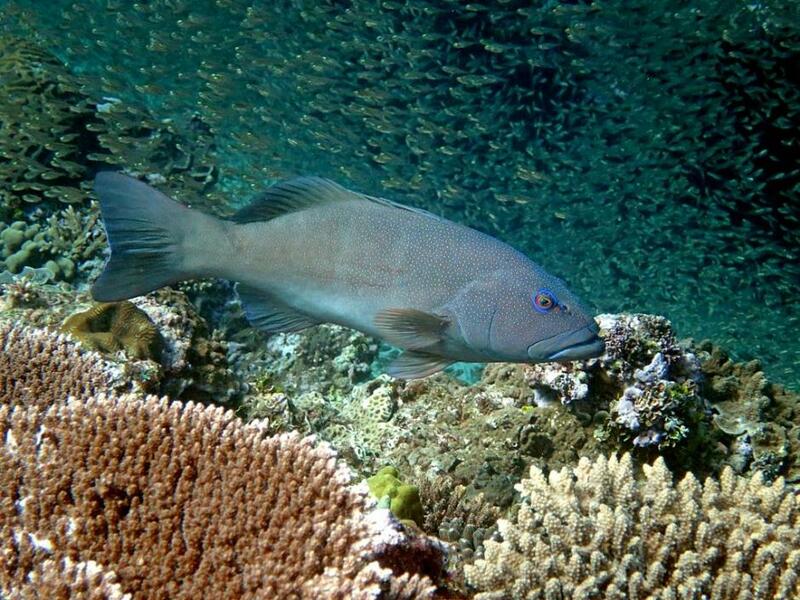 The number of coral trout declined by approximately 50 per cent after tropical cyclone Hamish in 2009, in both green and blue zones. However, coral trout biomass only declined on reefs in blue zones, as reefs in green zones retained more, larger coral trout. The large breeding coral trout that remained on green zone reefs after cyclone Hamish may aid replenishment of nearby fished reefs where populations were depleted. The fish species richness (a measure of biodiversity) was slightly higher in offshore green zone reefs than on fished offshore reefs. Networks of no-take marine reserves (NTMRs) are widely used for preserving exploited fish stocks and for conserving biodiversity. We used underwater visual surveys of coral reef fish and benthic communities to quantify the short- to medium-term (5 to 30 years) ecological effects of the establishment of NTMRs within the Great Barrier Reef Marine Park (GBRMP). The density, mean length and biomass of principal fishery species, coral trout (Plectropomus spp. ), were consistently greater in NTMRs than on fished reefs over both the short- and medium-term. However, there were no clear or consistent differences in the structure of fish or benthic assemblages, in non-target fish abundance, fish species richness or in coral cover between NTMR and fished reefs. There was no indication that the displacement and concentration of fishing effort reduced coral trout populations on fished reefs. 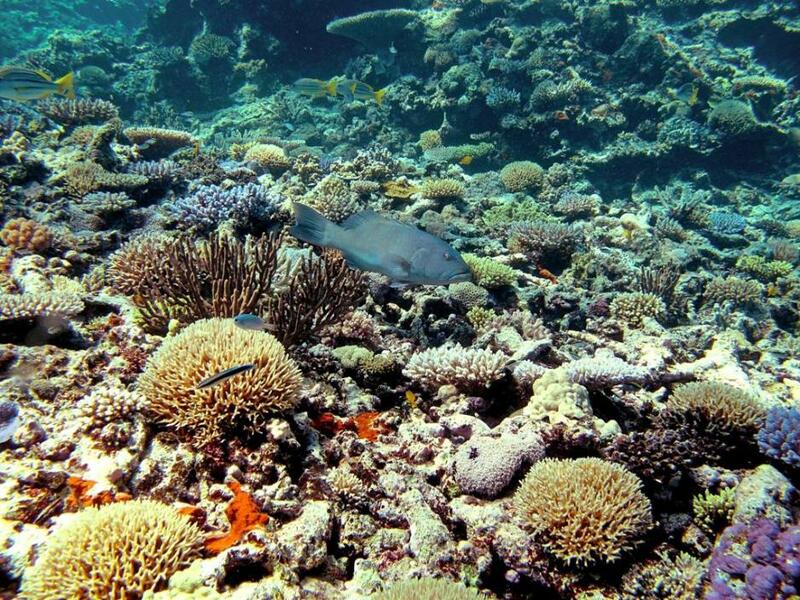 A severe tropical cyclone impacted many survey reefs during the study, causing similar declines in coral cover and fish density on both NTMR and fished reefs. However, coral trout biomass declined only on fished reefs following the cyclone. The GBRMP is performing as expected in terms of the protection of fished stocks and biodiversity for a developed country where fishing is not excessive and targets a narrow range of species. NTMRs cannot protect coral reefs directly from acute or chronic regional-scale disturbances but, following a strong tropical cyclone, impacted NTMR reefs supported higher biomass of key fishery-targeted species, and so should provide valuable sources of larvae to enhance population recovery and long-term persistence.